The goal of the game is to pop the balloon so you can unlock the next level. 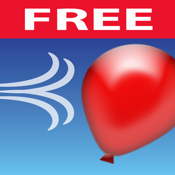 Drag the wind graphic to blow the balloon so it floats into the spikes and pops it. You will need to navigate around obstacles and swirling wind.